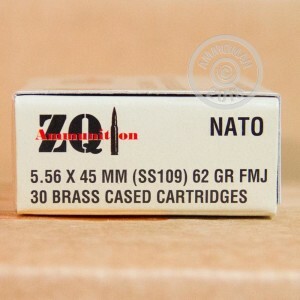 This 5.56 NATO ammunition from ZQI will deliver hours of quality target practice for your AR-15 or other .223/5.56 NATO rifle. Each cartridge fires a 62 grain full metal jacket bullet at a muzzle velocity of 3,000 feet per second. This ammunition has similar ballistics to M855 ball from other manufacturers--a plus if you don't like adjusting your optics. These cartridges are loaded in Turkey by defense contractor MKE using non-corrosive Boxer primers and brass cases. In operation since 1950, MKE is the official supplier of munitions to the Turkish Armed Forces. Buying by the case doesn't have to mean outrageous shipping charges. 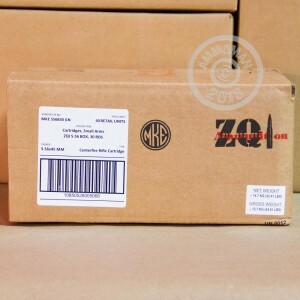 Pick up this 1,200 round case or any other items totaling $99 or more to get free shipping from AmmoMan.com. 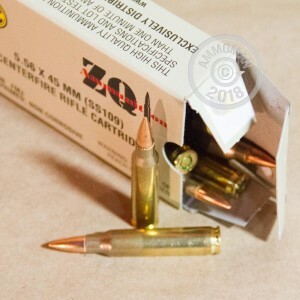 My only other comparison to on-line ammunition ordering has been through one other competitor and will say, AmmoMan exceeded my expectation in every way. First, free S&H if buying $99+ worth of ammo. Then again, who would buy less via this medium? Second, quality packaged, fast delivery, and again the brass is not defective carry overs from a larger distributor. Finally, as to the performance characteristics for simple target shooting at 100-400 yards, the ballistics and shot groups were consistent within a 3-5" diameter with the occasional 'wingers'. Not exactly, a sniper but cannot understate the quality and overall customer service. Thank you AmmoMan. No issues of any kind for my Colt AR and girlfriend's Bushmaster AR. Gonna buy more very soon.